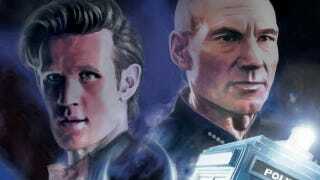 In this week's comics, Doctor Who and Star Trek cross universes! What's coming into comic shops tomorrow? A clash of two venerable television shows, Batman battling architecture-themed supervillains, and a new issue of Jeff Smith's Rasl. Set sonic screwdrivers to stun. When the Federation's most terrifying enemy strikes an unholy alliance with one of the Doctor's most hated antagonists, the result is devastation on a cosmic scale! Spanning the ends of space and time itself, Captain Jean-Luc Picard and the crew of the USS Enterprise find themselves joining forces with the Doctor and his companions, with the fate of the galaxy hanging in the balance. Other debuts this week include the Teen Titans spin-off series The Ravagers, Franco and Art Baltazar's Superman Family Adventures, and the Mike Mignola-penned one-shot BPRD - Hell On Earth: Transformation Of J.H. O'Donnell. As for other issues, there's a new installment of Jeff Smith's fabulous dimension-hopping book Rasl. Other sundry reads in the grab bag include Angel and Faith, Wolverine And The X-Men, Walking Dead, Incredible Hulk, American Vampire, and Teenage Mutant Ninja Turtles (preview here). Two consistently enjoyable DC titles — Batman and Animal Man — are also releasing annuals this week. As chairman of the Gotham Landmarks Commission, Bruce Wayne has been a key part of this boom, which signals a golden age of architectural ingenuity for the city. And then, the explosions begin. All manner of design-related malfunctions - faulty crane calculations, sturdy materials suddenly collapsing, software glitches, walkways giving way and more - cause casualties across the city. Other graphic novels that may be worth your gander include a new volume of Adam Warren's Empowered, the first Starman omnibus on trade paperback, the first volume of the New 52 Wonder Woman, and a new Avatar: The Last Airbender paperback. And as usual, here's the list of everything being released to comic stores tomorrow, and you can find your nearest comic retailer here. Happy reading, gang!